The Schoenbaum Family Center and Crane Center for Early Childhood Research and Policy offers Summer Success camps for children entering kindergarten in the fall. The camp provides two free four week sessions with breakfast and lunch provided. Children build their knowledge in language and literacy, math concepts and peer relationships through creative hands-on activities including storybook reading, art and glass projects. Priority is given to children in the Weinland Park neighborhood and those who have not attended preschool. 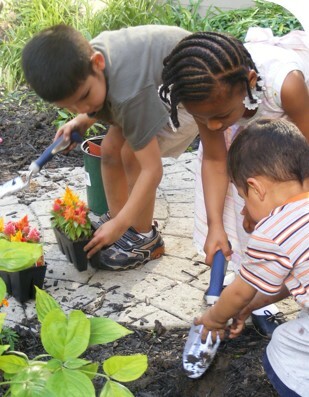 Children receive free admission to Franklin Park Conservatory and the Columbus Museum of Art. The program is funded through a $60K Ohio State Impact Grant with the support of other community organizations. The Summer Success program was developed in consultation with researchers, educators, and community partners in the field of early childhood education. Program materials (daily lesson plans, sample schedules, recommended storybooks, suggested creative and auxiliary activities, and select screening and assessment materials), are provided free to early childhood educators and community partners who are interested in implementing the program. CCEC white papers focus the discussion of children’s well-being on evidenced based facts and provide practitioners and policy-makers the tools to understand matters of pressing concern. For more information contact: Literacy Technician, Kari Welch or call 614-247-7488.